WASHINGTON (CNN) - President Barack Obama broke out his pens Wednesday to sign legislation reauthorizing the Export-Import Bank, which makes it easier for U.S. companies to sell their goods overseas by providing financing for exports. In a rare bipartisan vote, Congress passed the legislation in mid-May. "There are a number of things that my administration can do on our own and we're gonna keep on doing them, but it gets a whole lot easier if we get some help from Congress, and this is a great example and great model of what can happen," said Obama at the Eisenhower Executive Office Building signing ceremony. The Export-Import Bank, which dates back to the Roosevelt administration, is tasked with providing loans and other support for both large and small businesses to ply their products outside the U.S. borders. These loans are generally considered to be more risky due to the volatility of the overseas marketplace. In the Senate, the reauthorization passed by a vote of 78 to 20. One of those "no" votes came from Sen. Mike Lee, a Republican from Utah. "We need to end the corporate welfare that distorts the market and feeds corny capitalism," Lee said on the Senate floor on May 15. "The corporations that largely benefit from the Ex-Im Bank should have no trouble marshaling their resources to compete in today's economy." 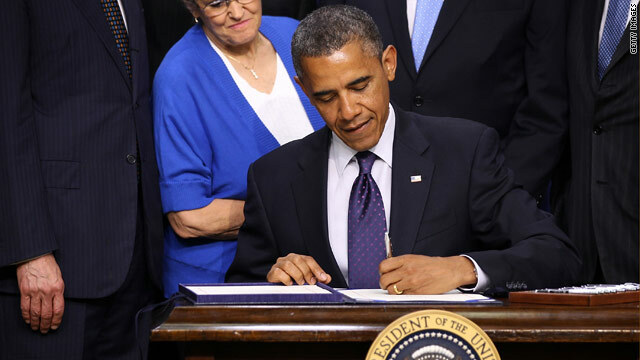 The legislation Obama signed allows the bank to approve new financing until September 2014. It also permits the bank to increase its lending limit to $120 billion immediately. In the longer term, that limit can be raised to $140 billion if the bank submits a business plan and continues to maintain a low default rate on its loans. During the signing ceremony, the president listed other goals he would like Congress to work toward, including providing a $3,000 credit for Americans who refinance their homes, supporting clean energy, and working to create a better job market for veterans. Also on his congressional "to-do" list is help for small businesses. "Congress still has the opportunity to do more to help small-business owners, who create most of the new jobs in America so we want to give them a tax break for hiring more workers and providing those workers higher wages," he said. According to a White House fact sheet on the bill signed Wednesday, Export-Import Bank authorizations last year reached $32.7 billion, "supporting $40 billion in export sales and 290,000 American jobs at more than 3,600 U.S. companies." The president used 10 pens to sign the export-import legislation, a common White House practice that allows each of the pens to be either displayed or distributed as a souvenir. CNN Producer Scott Spoerry contributed to this report. This Great President is doing thing for LONG TERM solutions to America. Its slowly but surely getting better & better. Home Sales up, Job gains up, Gas down, & the Promise of Natural gas going around the World from here to get off The Middle East as a National Security Issue & Equal rights for Woman in Every way shape & Form. We dont want to go Backwards & Experience another Bush as in Romney to destroy Progress & Have another Great Depression. Every tome Obama's pen touches paper, something bad happens. THEY SAY THE SAME THING WHEN REPUBLITARDS TOUCH A TOPIC. That is true as well. They just tend to sign less "world saving" legislation. Apparently Obama, and Congress, haven't beed watching the economic news coming out of China and Europe..., again. Now he can blame Greece and Spain. My Bad, Great Recession, As Georgie boy say, I got a great Idea..... Lets Make up a War under Fakse Pretences..... Yae thats the ticket..... Yea & then lets find a Way NOT to pay for it. Russia is our Biggest Foe..... SAME CONCEPT, Man Mitt, You are such a WHACKJOB!!! yea wills or maybe we should double the national dept again on B.S. social programs that only benefit the big unions and Political donors. And how about Obamas war in afganistan ..at least GW ended the war in Iraq before he got out of office even if Oblama wants to take credit for it. George W. Bush did not pay for his Iraq War waged on a lie about non-existent WMD, and FYI that war did not end until December 15, 2011. So quit trying to rewrite history. George W. Bush did not end that war the Iraq's basically ended that war when they asked us to leave. The Iraq War cost $720 million per day... each day....of which only $280 million per day was ever funded. The other $440 million per day that it cost was the debt bomb Bush was bundling with interest owed, and kicking it down the road to the next president. WASHINGTON – A somber President Obama declared an end to the long and costly Iraq war Tuesday night, pledging he now intends to "turn the page" to America's economic revival. Nice try txpayer12 with the lie ....but facts are facts and lies are lies..and your's is a doozy. jean2009 is using quotes from USAToday and Daily News!? And u thought I was confused....?? txpayer12,you know for a fact,something you republicans forgot long ago that under Pres.Obama your taxes have been lower,that's a fact,gas is lower since he threatened people on wall street about commodity manipulating and hes getting donations from unions,you know that, just like Romney from the Koch brothers ,Karl Rove and others.You do sound hypocritical,almost racist like the rest of your kind because of his color.It wasn't like this with Bush and you know that, even though he was a moron that crashed our economy,lied to create wars,made Cheneys Halliburton while still VP rich.Isn't that enough,now ya throw us that Mormon moron Romney at us saying he's good for this country,even you hypocrites don't believe his crap,do ya!! !If you "really" think Pres.Obama" lies" as you hypocrites say,if Romney would get in,but he won't,he'd lie to us all the way to another "Depression",something another republican president got us into,remember Hoover,it took another Democratic president named Roosevelt 12 years to fix that big screwup,read up and enjoy,so you know better next time I lecture ya!!! Yes..dimwit, I provide my information from many sources...but you on the other hand make yours up without sources. FYI: Here are the CNN, Washington Posts, and BBC reports for the end date of the Iraq War on December 15, 2011... so un-confuse yourself since I am not confused about when the Iraq War ended. Only dimwitted Rethughliklans it seems have problems with dates and history. Hey mitt. release your taxes. why get an extenion until after the november election. what have you got to hide besides your foriegn bank accounts. we know you are worth hundreds of millions. you made so much in such a short time it must have been easy to steal from the companys and people that you wrecked. I wonder how obama will use this to buy votes. WHY? DID HE WRITE YOU A CHECK? as usual gracious when speaking about the bill getting passed. Unlike the repo idiots. Jerry put a sock in it no matter what the artical you keep making stupid comments. Go hang out with your birther buddies trump and mitt. If anyone iss buying votes it is good ol mitt kissing the donalds backside. What a president he will make. OBama 2012 Forward . Obamas biggerst supporters are generational wellfare recipents and big unions..kind of the same personality type.take it all and never pay back a cent..Look at the gm motor plants mostly foreign made vechicles in the parking lot of this big union company. Boy im glad my tax dollars went towards that again.. How many times have wwe bailed their sorry buts out anyway? 3 or 4..Its time to let the socalists go back to europe and illinois where they belong and let the taxpayers have a choice. This country was founded by a large percentage of liberal labor Freemasons. including Ben Franklin, George Washington, and John Hancock. Here are the 7 reasons why the founding fathers were liberal and why the conservative loyalist went back to England and King George. I bet they would be happy GM is around and providing jobs at union wage for working American families....from your tone you must be some foreign national wishing Americans ill. This includes the list of 7 reasons why the founding fathers were liberals. @ txpayer12,ever been in Flint,Detroit,Bay City,Michigan,that's GM,I'm a proud union worker welding on shutdowns on all those places and if somebody had s foriegn made car there they'd be warned,as well as you and your jap rice burner.And I'm retired and still pay more taxes than you,so quit acting so intelligent,you're not,so full of facts,you're not and try some facts on some time ,they're quite nice when ya know what you're talking about,not..Romney is the reason for contraceptives,his five sons as well as he run from wars,but talk like warriors,he talks of economic sucess,but left Massachusetts with over a 1 billion dollar deficet,47th in job creation,even though he wasn't there most of the time,much like Bush,477 days on vacation in his first two years in office,those MAN are facts,not BS,get it!! !Come back when you and your crew,you know who you are,I've lectured you all once,didn't I,can get better trash on this incumbent,keep tryin,your buddies on Capital Hill sure are!! Brilliant again President Obama-the more they export the more manufacturing jobs open up. Intelligent people can grasp this. Un- intelligent will say you are spending too much. Go forward not backward. Great job. IRONICALLY, JERRY USED 10 PENS JUST TO WRITE HIS OWN NAME TODAY. HE COULDN'T MAKE UP HIS MIND ON WHETHER THE 'J' IS SILENT. HE FINALLY SETTLED ON DRAWING A CRUDE PICTURE OF SOMETHING RESEMBLING EITHER A FAT WEASEL OR RUSH LIMBAUGH. @December2012,you give jerry way too much credit,he can't afford a pen,just scratches rocks on his floors,that republican neanderthal and he's Rushes illigedimate child I've heard!! RIGHT JERRY!!! Working in the export/import industry we maintain an import department to clear goods coming into the U.S. and an export department shipping globally. going back 12 years these departments were almost equal in the amount of emplyees. Now I have sixty people in our import department and three in our export department. World trade has been our problem since quotas came off imports with China, Vietnam, India and Bangladesh taking our U.S. production and regional production that does require U.S. raw materials. All China needs from the U.S. is our scrap metal and paper for their production. Corporate America left us as workers and consumers developing new foreign markets. There is no coming back. It is nice to know that CNN reporters can also have dumb typing fingers on words spell check would miss. Although feeding "corny" capitalism makes a statement, I think Sally meant crony. Reauthorizing a bill to provide banking loans that will help us export more products, and create more jobs is a no brainer,but then Senator Mike Lee of Utah is the poster child for no brains. Great, if you want to sell product overseas you have to have offices and staff overseas, is that not called out-sourcing, or do the foreign companies line up to buy our goods, produced in China. Just what American taxpayers don't need, more risky loans on tax dollars. In 2011, the Export-Import Bank supported $41 billion in American export sales to other countries. Due to that support 3,600 American companies had income which made it possible for them to hire American workers for 290,000 export related jobs. So...NO the loans wouldn't be for goods produced in China which would be big corporations... not the small and mid-sized businesses. FORKED TOUNG. THIS PRESIDENT WILL NOT BE FOR ANY GENDER,RACE,CREED TO ACCOMPLISH HIS "AGENDA". HE EXCLUDES OUR RIGHTS AND AMERICANS,AS WE FOUGHT AND DIIED FOR THRU OUT OUR HISTORY. RIGHTS THAT SHOULD NEVER BE TRAMPLED ON. THIS PRESIDENT HAS EARNED THE RIGHT TO BE IMPEACHED. @NamVet,ya need help,after Bushs mess,ya want Pres.Obama impeached,get your head checked guy,veterans hospitals are all over the place,please get some help,ya need it!!! DAG!! Tell him Pete!! He sure does need help!! My husband is also a Nam Vet and has access to the VA Hospital everyday if he needs it!! Thanks be to GOG, Barack and Michelle Obama and everybody who has been working on behalf of all of Americas troops and veterans!! This man is sick!! The GOP is busy trying to cut vet benefits; making many of them have to reapply, or do means tests to see if they can find a way to kick them off the pension rolls!! Obama and his administration is fighting hard not to let that happen, although I'm sure the GOP in Congress will keep on until they figure out a way to do it anyway!! And especially, if and when they steal the election from Obama and let the puppet into the Whitehouse, Mittens Romney!! BTW, whose sons, neither of the 5 ever served a day in the military!! Gas is not cheaper. I just got gas today and its 4.34 a gallon in olympia Wa. 3 weeks ago it was 3.97. And When obama took office Gas was 1.78 a gallon thanks to Bush opening the Gulf. Well, 3.5 years later gas is still going up because Obama closed the Gulf and has stated that he doesn't care about the price of Gas. And unemployment is not going down. Less then 1% in 3.5 years is not good. Obama is part of the left trying to brainwash people and create dependants so you have to beleive them and do what they say. Just look at executive orders and the ndaa. obama is the liar and outsourcer in chief. The huge Stimulus packages he signed did more good for other countries like China and Brazil than it did for the U.S. Anyone is better than obama. @sithlord1,who said the strait is closed,get your facts straight,the Gulf of Oman is open,the strait of Hormuz is open,production is up,consumption is down.News said the other night some states are still having prices rising because of where they're located,that's why,how close to a port or terminal are ya,that makes a difference.Don't blame the president for everything,unemployement is down,employement hirings are up,27 straight months of positive postings,he's doing everything he can with a no nothing congress,you're proud of them I bet,aren't ya! !He got GM and Chrysler from going bankrupt,even though Romneys said he wanted them too..Romney wants the housing markets to crash,then buy homes on pennies on the dollar,real presidencial material isn't he,he's your boy,you'll gave him all to yourselves come November,after Pres.Obama beats him,okay!!! Good Luck,...well I'll take that back, because I know luck comes from Satan nost of the time, but be blessed Jean2009 and Pete in your attempts to continue to impart truth rather than 'facts' to trolls who are intentionally ignorant!! I thank you also for the depth of knowledge and reminders you are rendering to this site. Hey Jean! Been a long time, but I have been busy on another site that I feels desparately needs me and my scores of knowledge on what the main problem is!! You know what I mean Vern??? LOL!! !